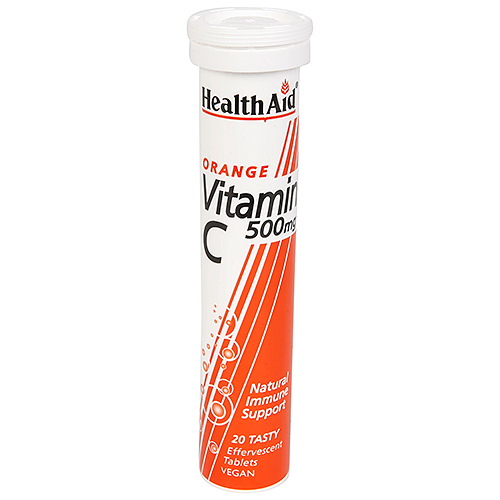 HealthAid Orange Vitamin C Tablets are dissolvable refreshing, fruit flavoured tablets which make up into a drink containing half a gram of Vitamin C in a readily absorbable form. This product provides an alternative way of taking supplements especially for those who have difficulty in swallowing tablets. Acidity Regulator (citric acid anhydrous, sodium bicarbonate), Vitamin C (ascorbic acid), Bulking Agent (sorbitol), Sweetener (mannitol, acesulfame K), Flavour Enhancer (orange flavour, lemon flavour, apricot flavour), Binding Agent [polyvinylpyrrolidone (PVP)], Natural Colour (redbeet powder, riboflavin-5-phosphate). Take 1 tablet daily, to be dissolved in a glass of water. Do not exceed recommended daily intake unless advised by a suitably qualified person. 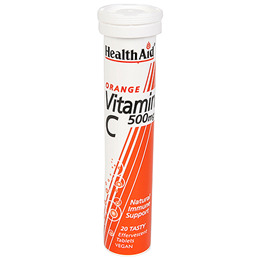 Below are reviews of HealthAid Vitamin C 500mg - Orange Flavour - 20 Tablets by bodykind customers. If you have tried this product we'd love to hear what you think so please leave a review.